Pure water does not exist in nature; all water in its natural state contains varying amounts of dissolved and suspended matter. Osmosis is the process in which a solvent, such as water, flows through a semipermeable membrane from a less-concentrated solution to one with a higher concentration. This normal osmotic flow can be reversed (reverse osmosis) by applying hydraulic pressure to the more concentrated (contaminated) solution to produce purified water. There is no perfect semipermeable membrane. A small amount of dissolved salt is also able to diffuse through, but this results in low concentrations relative to the feedwater values. The benefits of reverse osmosis technology should be well understood in water treatment for power generation, particularly because of its potential to reduce operating and maintenance expenses. For most sources of water, RO is the least expensive way to remove the majority of a large concentration of dissolved salts. Results: Results are listed down to the detection limit of the instrument used. Where results fall below these limits they are reported as less than and the detection limit. A dash indicates testing was not requested or was unable to be run. Table 1: Water analysis. This table shows results from an actual water analysis. Results are listed down to the detection limit of the instrument used. Where results fall below these limits, they are reported as less than the detection limit. A dash indicates testing was not requested or was unable to be run. 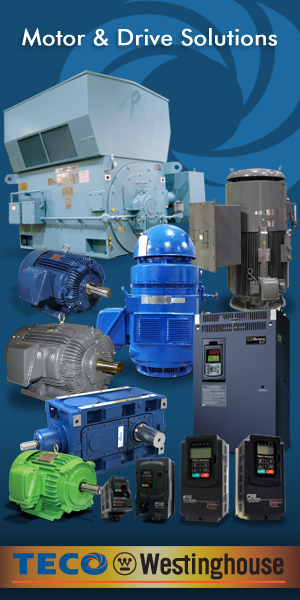 A well-designed pilot study uses components that have been scaled down but still offer the same type of media, and use similar flow velocities and exposure times. The pilot RO (see figure 1) should duplicate the permeate recovery, the permeate flux rate (that is, the permeate flow per unit of membrane area), and concentrate stream vessel exit velocities, along with the scale inhibitor dosage and shutdown flush methods. Table 2: Scale formation potential. 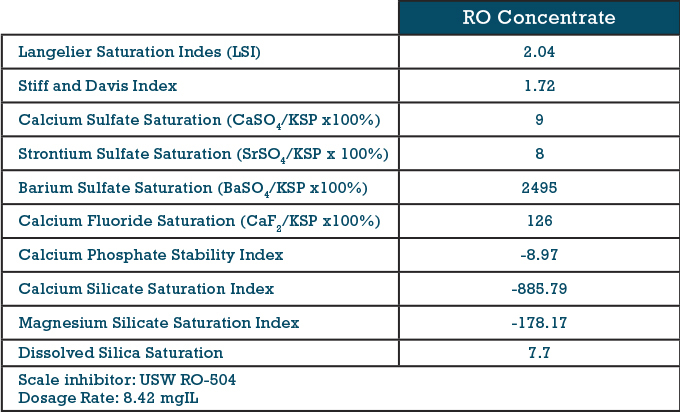 This table shows partial results generated by a scale inhibitor dosage program for a given reverse osmosis (RO) recovery. The sale inhibitor utilized was USW RO-504 at a dosage rate of 8.42 milligrams per liter (Ksp = solubility product constant). 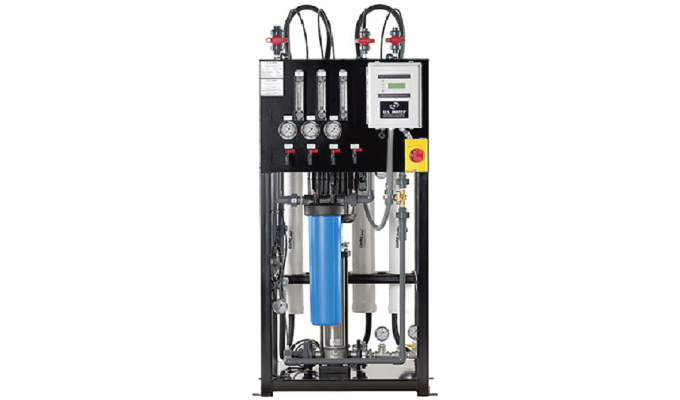 Figure 1: Example of a pilot Ro system. The pilot RO system should duplicate the permeate recovery, the permeate flux rate (that is, the permeate flow per unit of membrane area), and concentrate stream vessel exit velocities, along with the scale inhibitor dosage and shutdown flush methods. 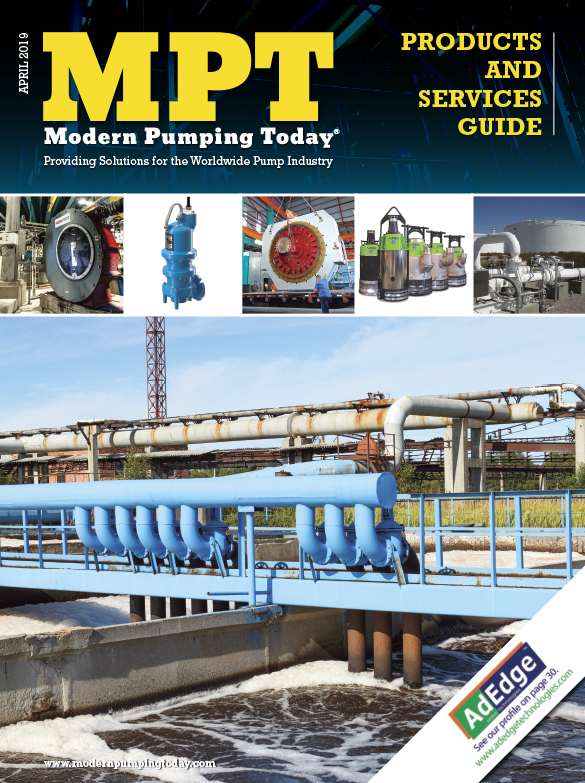 The next section of this article will discuss the issues related to the water treatment equipment that reats the water before it gets to the RO system. In the final installment of this series, we will take a closer look at membrane fouling and filtration. Fouling doesn’t necessarily reduce RO membrane life if the RO is effectively cleaned. If the RO is allowed to foul too severely and cleaning is not effective, then the membrane will likely continue to lose performance. 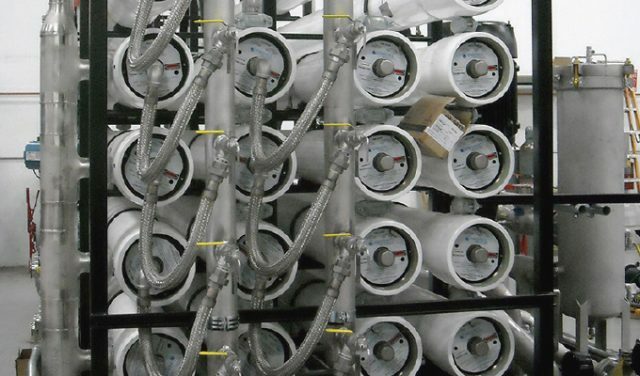 Furthermore, membrane filtration is becoming more common in various applications, including pre-treatment for RO systems.